…to this special souvenir edition of The Illustrated Diamond Jubilee to celebrate 60 years of Her Majesty Queen Elizabeth’s reign. From her earliest years as a child and young princess through the coronation and her adult life as a Queen and mother we have complied a breathtaking selection of unseen and rarely viewed images from the historical archives of The Illustrated London News. The Illustrated London News was in the fortunate position of being granted the kind of special access to royal families that other newspapers could only dream of, as the specially commissioned past covers in The Illustrated Diamond Jubilee show. We also have fantastic photography, some of it previously unseen, of Elizabeth as a baby and then a young girl, growing up with her family in Windsor Castle and the other royal residences. 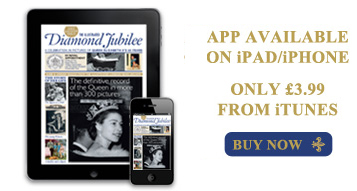 We look at her love affair with Prince Philip, which has endured for long over half a century, with more behind-the-scenes images showing the pair enjoying time together as well as all the splendour of her Coronation in 1953 and the royal tours and visits which have followed throughout the last 60 years. As royal expert, Robert Hardman, says in his introduction, the Queen is enjoying herself more than ever in 2012, with the afterglow of last year’s Royal Wedding meaning her popularity both in Britain and abroad is as high as it has ever been. 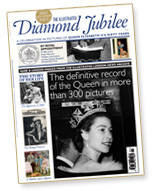 The Illustrated Diamond Jubilee is on sale from 30 March at WH Smith, Royal Collection shops, Peter Jones, Balmoral Estate; from mid-May Waitrose, Tesco, Sainsbury. Please select your country for delivery and click the BUY NOW button. We curate content, narrate stories and drive engagement, connecting brands with their customers across digital and print channels.